Verizon's Droid, as we all know by now, does a lot of things (remember the commercials?). One feature conspicuously missing from the handset, however, is multitouch browsing. Oddly, the phone itself does support multitouch functionality; the European version, the Milestone, even allows for it. No one's really quite sure why the American Droid doesn't -- well, no one who's talking, anyway. Some theories suggest it might have something to do with Apple's multitouch patents, while others hypothesize that multitouch might clash with existing Android 2.0 applications. Whatever the reason, one thing's for certain: It sure would be nice to pinch and zoom while surfing the mobile Web. Well, my fellow Droid fans, I come bearing good news: Multitouch has arrived. You just have to know where to find it. Our answer comes in the form of a cool little program called Dolphin Browser. 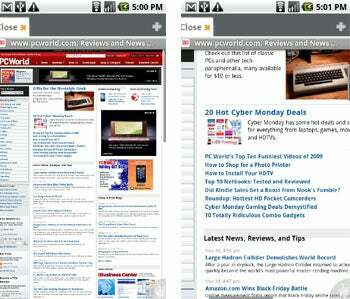 The app, available for free in the Android Market, packs a lot of extra power into your Android browsing experience. I've been using Dolphin in conjunction with Android's built-in browser for a while now, but it just hadn't quite won me over enough to become my system default. Over the holiday weekend, however, its developer released an updated version that added in the multitouch support -- and, suffice it to say, I'm in. Dolphin's multitouch function will be familiar to anyone who's used an iPhone: You pinch your fingers together to zoom in, pinch them apart to zoom out. Couldn't be simpler. The rest of what Dolphin offers shouldn't be overlooked. Its gesture-command support is, quite frankly, almost as impressive as the multitouch. You set up a series of custom gestures to control everything from navigating forward or backward to opening your bookmarks. Then, anytime you want to perform one of those commands, you just touch the gesture symbol and draw in your lines. 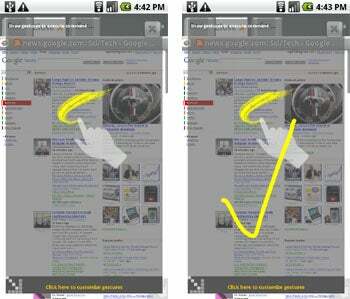 Dolphin Browser also supports multiple tabs -- I find them much easier to visualize and manage than the multiple windows in Android's built-in browser -- and some integrated social sharing options. One quick tip: When you're exiting the app, rather than just hitting your Home button, press and hold the back button for two to three seconds. That'll bring up a menu that allows you to fully stop the process and clear the cache, which seems to help prevent some problems people have reported with the program force-closing upon exit. You can see more about the Dolphin Browser for Android in this video. Neither the grammar nor the spelling is the greatest -- but forgive that, and I think you'll be pretty impressed.